Is Kerry Washington Happy With "Scandal" Series Finale? When you've played a character as iconic as Olivia Pope for seven seasons, she's bound to rub off on you. 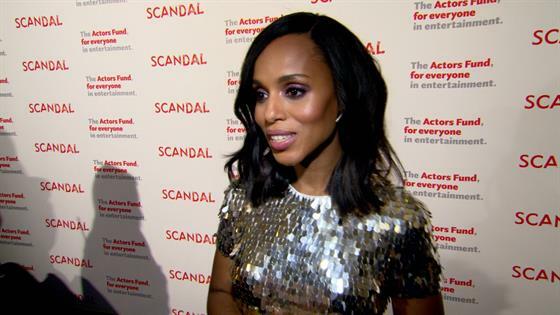 Kerry Washington said she's been changed by Scandal's Gladiator in white. "I think playing Olivia has really taught me a lot about resilience and about strength, about courage. I think her fearlessness has really helped me to face a lot of adventures in life that I'm not sure I would have otherwise," Washington told E! News. Series creator Shonda Rhimes has been changed too, but by working with Washington. "It's funny. We were just talking about something and I just leaned over and I said to her, ‘You have no idea how much I've learned from you.' She looked at me like I was crazy," Rhimes told us. "And it's interesting because we had such a close relationship that I'm not even sure I can enumerate all the things that I learned from her…I think I would still be a very introverted, shy person if it weren't for Kerry. She's helped me come out of my shell in many, many ways," Rhimes continued. Scandal wrapped up its seven-season run with Olivia Pope getting a happy ending…of sorts. She was finally free of Washington, DC and politics to do whatever she may like…and it was left vague like that. The series ended with two young African-American girls looking at a portrait of Olivia Pope in the National Portrait Gallery. Was it for Olivia Pope's past actions, or future…as president? What does it mean? That's a secret Rhimes will likely never tell. However, Washington said, "You know what? If Shonda Rhimes is satisfied, I'm satisfied." Watch the video above to hear more from Washington, including if she got any of Olivia Pope's bags.